I wanted to pose a question on here and see what other folks would do in my situation. Last year I bought a Performax 16-32 Drum sander off of Craigslist for $125. It was in great shape and had a new conveyor belt and came with several roles of sand paper. It has worked great for the last year until a few weeks ago when a spark jumped from the smaller motor to the outlet for the large motor. After resetting my breaker, I tried to turn the sander back on and I found that the sander motor still worked but the smaller conveyor motor wouldn’t start. I talked to Jet a few times and they told me to take apart the motor box to see if a wire had came loose. I did and I found that the conveyor circuit board was fried. I was informed by a Jet associate that I would have to get a new circuit board but one of those costs $350 and it wouldn’t be the exact one I was looking for. So here is what I am wondering: Does anyone know of an easier solution to the problem I am having with this sander? I included and image of my current circuit board. Would you put out an additional $350 for a circuit board that you aren’t confident will work or confident you could install? I wouldn’t mind paying the $350 if I knew it was guaranteed to work since I got the sander for so cheap but I don’t want to waste my money or my time on something that may not fix my issue. Let me know your thoughts on this situation. I wonder if you can bypass all of that and directly wire the motor to a dimmer. That way you still can control the speed of the conveyor motor. 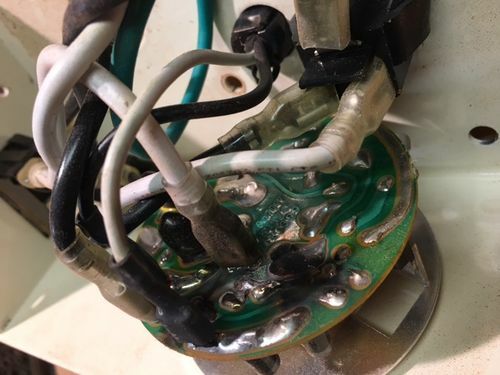 Looking at the picture, it looks like a capacitor or something has popped so you may be able to remove that one item with soldering iron and get a replacement for it. I think mahdee is taking the right approach. I would exhaust every possibility to find an alternative to spending $350 bucks on that circuit board, which may not even be the solution to the problem. Unfortunately, electrical stuff is above my pay grade so I’m hoping another member can help you with the answer. Found this. I’m not sure how valuable the circuit diagram will be for you, or even if it is for your part. I didn’t take the time to read the entire thread either, so it may be worthless, or it may contain a gem. Bottom line is, it doesn’t appear to contain any components other than wiring. If you simply have a circuit board trace that fried, you can jump that. I’ve had the same part “fry” on my 16/32. It’s basically a light dimmer circuit. The first time it blew one of the large rectifier diodes, simple to replace. The second time the belt started “surging” and I replace the TRIAC/DIAC and all is well again. I could not justify paying the $300+ replacement price. Look on ebay for the unit, some here on LJs also have offered these parts in the past for a lot cheaper. If you do replace it, the original is hard to find and most replacements (the entire box) now have the “smart feed” circuitry which adjusts the conveyor feed rate depending on the drum load, a worthwhile upgrade.